Restaurant Week in Jamaica is an annual event I look forward to, in one week there are a plethora of restaurants having discounted prices. They fall under categories such as Tasty, Savoury, Delectable, and Epicurean; which offers 3 course meals in different price ranges. As well as Morning Bites and Nyam & Scram, which offers discounts on breakfast combos and lunch combos respectively. Last restaurant week, I went to nyam and scram some lunch at Raffaele’s Gourmet Pizzeria and Grill. They had really nice options, and each meal came with a bowl of cream of pumpkin soup for appetizer and a slice of cake for dessert. It was an overcast day with the sun playing hide and seek, the weather was lovely to me, it was warm with a little bit of breeze. We sat at an outdoor table with a huge patio umbrella. My Shrimp Burger & Fries. We didn’t have our meals the conventional way because the soup wasn’t ready when we had arrived. So, we ordered the main course first. I had the shrimp burger and fries. The shrimp burger patty didn’t look how I expected. It came with tarter sauce and the usual condiments, lettuce and tomatoes; while the fries were unexpectedly seasoned fries. 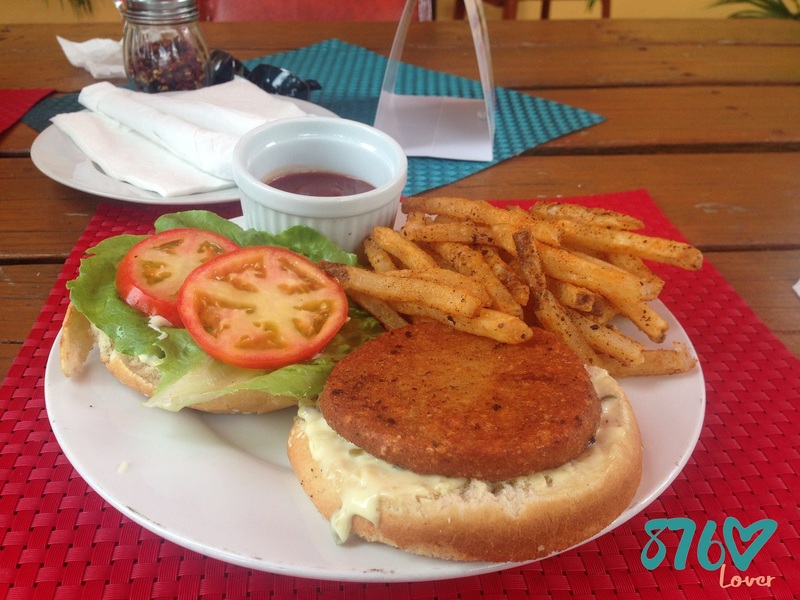 The burger tasted like a fish burger from the brand Reggae Jammin’ but cooked properly; it tasted good, nothing exceptional, but good nonetheless. 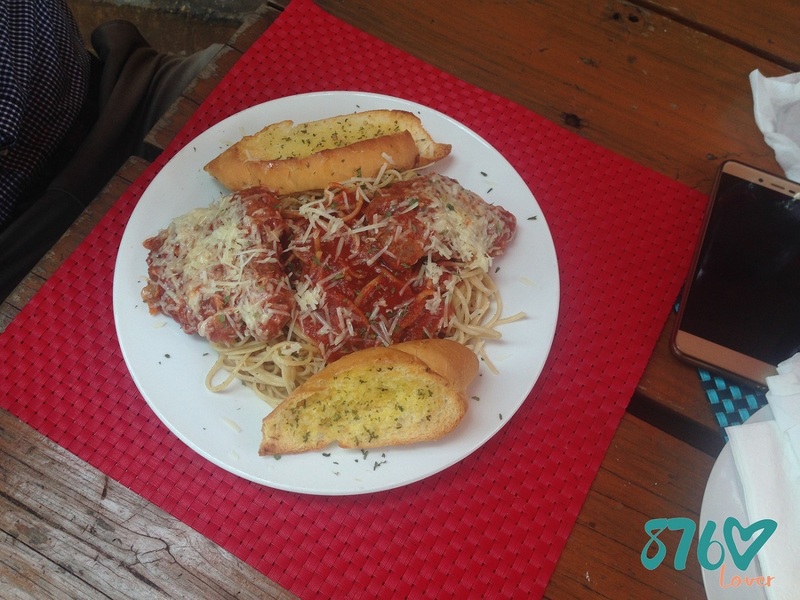 My date had the chicken parmesan on linguine pasta with marinara sauce, served with garlic bread. When I saw his meal I was envious, the melted parmesan cheese looked amazing. As customary with my dates, we tried some of each other’s food, it tasted as great as it looked. When we finished our meals the cream of pumpkin soup was ready to be served, so we had it. That was the highlight of the lunch for me, the soup tasted spectacular. Having it after the burger filled me to capacity, I was stuffed. You should know, I still ate the cake we got for dessert, the slice wasn’t big, it seemed to be the cherry on top. I should have picked a fancier main course but lesson learnt, pick something basic, it will taste basic. I had a good time at Raffaele’s, even though my choice wasn’t the best; my date’s food tasted good and the cream of pumpkin soup wowed my taste buds. I will be going back for sure, I want to try one of their pizzas next time. Find them at Shop #5 in Orchid Village Plaza, 20 Barbican Road, Kingston. I had the same meal at Raffaele’s Nyam and Scram too! Like you say, I wasn’t wowed but they received a pass from me. The cake was stale 🙁 but the soup was the best part of the dish and the ambiance very nice. I’ve yet to try them outside of Restaurant Week though. Someday in the future. When I went the cake was alright, but I’m glad I have someone to second my rating! I will be back for sure, I want to have a taste of the other dishes they offer.